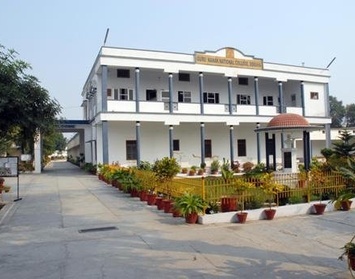 Guru Nanak National College Doraha, Punjab,Admission, Courses, Fees, Photos and Campus Video, Review, Ranking Details. President of India and Chief Minister of Punjab at that time. It runs courses like B.A., B.Com., B.C.A., B.B.A.,B.Sc(. (Non-Med), M.A. (Punjabi), M.A. (Political Science), M.Com., M.Sc. (IT), P.G.D.C.A, M.A. (Sociology) and add on courses in Nursery Teacher Training, Animation and Graphics. A variety of elective options including skill based subjects are offered at the undergraduate level to the arts students. The college also offers Add-on-courses in Computer Based Accounting and Fashion Designing with UGC support. To improve employability through additional skills the college provides certificate and diploma courses in Computer Science and Applications to the students and non-students. In addition the college provides certificate courses in typing and shorthand both in English and Punjabi. Special courses are provided in spoken English, computer literacy, personality development etc. 1.Dr. Narinder Singh SidhuM.Sc. (Zoology), Ph.D.
1.Mrs. Amarjit KaurB.A. (Hons. ), M.A. 2.Mrs. Lovleen BainsB.A. (Hons. ), M.A., M.Phil., B.Ed. 1.Dr. Sukhwinder Singh VirkM.A., Ph.D.
1.Dr. Gurjeet Virk SidhuM.A., Ph.D. The campus spread over 17 acres of land was allotted in 1971 by the efforts of S. Parkash Singh Badal, Chief Minister of Punjab. The Foundation Stone of the college was laid on 8th of September 1972 by Giani Zail Singh, former President of India and Chief Minister of Punjab at that time. Some of additional specifications that college have, College Magazine, Youth Club, Computer Center, Audiovisual facilities, Career Guidance and Counseling, Remedial/special Coaching Classes, Students Welfare Council and hostel facility to girls.